The first steps into a new life and after. What a great day it is today! Happy Summer 2017! So it looks like it is truly springtime in Hungary right now. A great topic is coming up, actually something that I have been experimenting with for years. Initially I was itching to do some `gardening` during those long winter months in Hungary a few years back so I got some seeds and watched a bunch of educational Youtube videos how to sprout seeds and eat them. 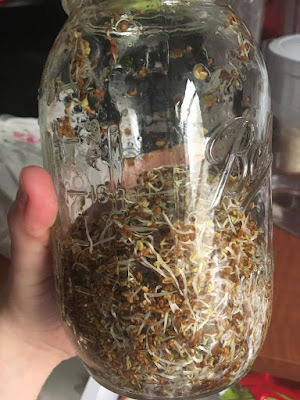 This time I used Alfalfa seeds that are actually very easy to sprout. If you have no experience with spouting yet, I recommend seed types that will sprout fast so you can get used to the process and see results without failure. Seeds that sprout fast and can also be found in your kitchen might be lentils, beans, peas, wheat. First stages of sprouting, happens after 1-2 days when you can see the little roots appearing. You can obviously eat them like this, but I would wait for a day or two to see more growth and nutritional value. The next stage is when the small leaves come out and they taste delicious. 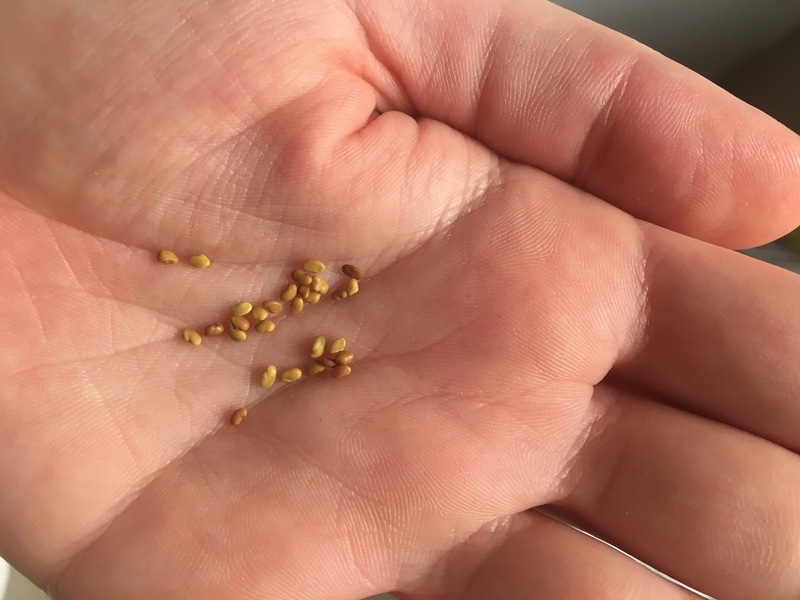 Depending on what type of seeds you sprout, you will actually taste the flavor of the plant in the tiny leaves. A jar full of sprouting seeds. You can put them on your sandwiches, in your salad, in soups...basically anything. They add flavor, depth, crunchiness and nutrition to any meal. I took a long walk today as the weather got a bit better. I snapped these pictures as it can inspire you during this harsh winter across the globe. Sending all these flowers to all Europeans who are fed up with degrees below zero and long for some sunshine! I have been meaning to write this blog post for weeks if not months so let`s talk about anxiety. Anxiety is a pretty bad symptom of low self-esteem, negative feelings about yourself, situations, everything that the past, present or future can involve. It might be a desire to do something as we feel uneasy, nervous, anxious about someone or something, and it most probably interferes with your everyday life, in some cases with your professional life and relationships too. Some people even need to take medication and visit doctors on a regular basis. I have recently experienced the effects of anxiety by seeing someone who I have known for a while and never thought that he fought this disease. His case is pretty serious and made me think of ways of me tackling anxiety (on a much lower level) in my personal life. In my humble opinion, whoever says that they don`t have any anxiety, they truly lie. You can have anxiety because of a job interview, a bad relationship, fear of the future, decision making, a new job, school, your kids, a family issue, health problems, friendships, basically anything. Even the most simple thing, like what to have for breakfast. Now, when I am over 30, and I see things a bit differently than 10-15 years ago, I can truly say that I can handle anxiety in certain ways and but only up to a certain extent. I am far away from a calm, chill mind but I am working on it very hard to free myself from the burden of it. I can get anxious and nervous when I face new situations and when I don`t feel prepared enough for any future happenings personally or professionally. I have found out throughout the years that some simple steps work for me to lessen the negative effects and actually turn them into something positive and useful. 1. Make lists, plan ahead: I almost always have a to-do-list that helps me prioritize and see what is ahead of me that day/week no matter if it is something personal or at work. 2. Clean your desk, your room, your house and essentially your life: every morning when I wake up and get ready to work, I try to organize a small section of the apartment meaning that I put away clothes, shoes, clean dishes whatever makes the place messy. 3. Do not overwhelm yourself with many resolutions: seriously, how many times have you sworn that you will work out five times a week, you only eat healthy, you will not spend money on clothes that you don`t even wear...? I did, many times. I do not create a long list of resolutions any more, I just stick to 1 or maybe 2 things at a time and be happy with the results. I am actually doing pretty well by not spending on unnecessary clothes any more. 5. Try to have some quiet time whenever you can: turn off your tv, the music, close your windows if you have noisy commute outside. Quiet your head and mind, and feel refreshed after even a couple of minutes of calmness. 6. Meditate: one of my husband`s friend struggles with anxiety issues and he told me about Headspace. It is an app that you can download on your Ipad or phone and listen to 10 minute sessions every day. I read so many reviews and everyone is amazed by Headspace, so am I, I truly recommend it to anyone. 8. Read supporting literature: whatever you feel like, honestly. You can read anything as long as your mind does not wander off and you r.e.a.d. I am telling you this because I am so bad at this. My mind goes everywhere, unless I have something in my hand that it so interesting that I just can`t stop and put it down. But it is pretty rare. 9. Color, yes, color some pictures like you did when you were 6: it calms your nerves and really helps clear your thoughts. First, I was very skeptical and I believed it was childish but no, it actually works. So many things happened recently that trigger everyone`s feelings towards hate, anger and division. It is really hard to control my thoughts and feelings so I don`t put myself to a dark place where it is difficult to come back from. It is also really hard to accept that other people have views that don`t even come close to the ones you stand for. The only thing I can do is to work on myself so that acceptance comes and I overcome my grief and I can look into the future with a fresh set of eyes. Karma works wonders and everything happens for a reason. These two rules work for me and build strength when I need it. As long as your family and your loved ones are healthy, you don`t need anything else. Money, material things and everything that comes with them are not important at all. I truly believe so. I have never ever followed any diet in my life. I was skinny, mostly too skinny all my life. Since I moved to the US, our (mostly my) eating habits changed for the worse. It was so easy to skip cooking and do a take-out or just simply hop in the car and sit in a restaurant...and worst of the worst: do a drive through. First, when I started to put on some weight it made me happy as it was almost impossible before (besides those chocolate and pizza eating months in England back in 2008-2009). Then I came to a realization that I should probably pay more attention to our eating habits and that now is the time to change and shake things up over 30. I came across the Whole 30 diet years ago, but it never really interested me as I haven`t really looked into dieting and always thought that it is solely to loose weight. A couple of weeks ago I was reading posts on Instagram and I read about the Whole 30 in a post that caught my attention and I started to do some serious reading about it. I became more and more interested and I turned to Pinterest and looked for Whole 30 recipes. I was shocked how easy and natural the recipes were and how close it brings you to healthy and nutritious way of eating that we tend to forget due to our busy lives. I am not going to go into very specific details of the diet as you can read so much about it on the internet. Let`s just say that it takes 30 days without dairy, legumes, grains, bread and pasta...oh, and without sugar!!! I just finished the 30 days with my husband and I feel like a different person. No joke. Changed my relationship with food, cooking and reconnected me with my kitchen and healthy recipes. I am not saying that I won`t be eating sugar, bread or delicious pasta but I will be more conscious about my choices as those 30 days allowed me to see the better of me. A Hungarian girl living, eating, drinking, sleeping, walking, travelling, sewing, cooking, baking, gardening and making her husband's life happy in Miami, Florida. © Agnes Patkos 2013 Original content is solely owned. Please do not repost any photos.. Picture Window theme. Powered by Blogger.